When I moved into my new house, I was shocked by how dirty and old the tiles in the entire house looked. I wasn't sure if they were supposed to be like that or if they were just really dirty. 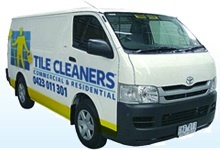 I decided to call Tile Cleaners and ask them to have a look and tell me what I could do to improve the look of my tiles. Tile Cleaners came the same weekend and managed to make my tiles look brand new. They also informed me that the sealer would protect my tiles for years to come. Amazing! Thank you guys! My floor looks gorgeous. Thank you TileCleaners for dealing with the solvent sealer I had and resealing my hallway; I know it's a pain but you did a great job. I will definitely call you again as I need help with my tiles in the office.